It’s Gratituesday! Today I’m grateful that generosity and feels extra abundant this time of year. 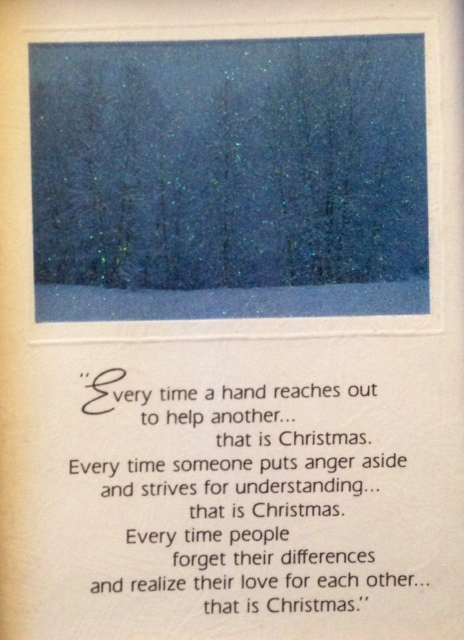 We received this Christmas card many, many years ago. The idea struck me so powerfully I chose to frame the card and kept it hung up in my room year-round for a long time. I wish I knew who sent the card. Even more, I wish I could give credit to whoever said this. December seems filled with real-life stories of strangers helping strangers, random acts of generosity and secret gifts of stunning proportion. I love reading about or watching such stories. Hope takes a deep breath with each tale told. I can tell you, though, that such things don’t just happen in December. I’ve been the recipient this past year of Christmas every single month in one surprising act of love or kindness after another. For some of it I have no idea who to thank. I can only pray that such generosity finds the giver blessed beyond anything they’ve given. For other blessings showered down on me, I’m woefully inadequate at expressing thanks. Thank you if you’ve given anything to anyone for any reason this year. You may have very easily touched my life and lifted my spirits unknowingly. For me it’s been a beautiful Christmas year! Happy Holidays! I hope they live on for you long after the decorations get put away and the carols stop playing.